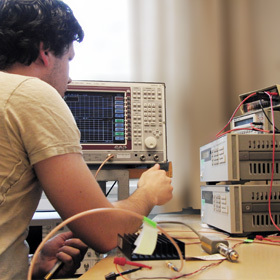 The Department of EIT conducts high-quality research in a variety of areas in electrical engineering and computer science, ranging from pure theoretical research to applied projects in close collaboration with industry. It is at the forefront of international research in most of its areas. The Department of EIT consists of about 100 people active in research, divided in seven research laboratories: Broadband Communications; Communications Engineering; Electromagnetic Theory; Integrated Electronic Systems; Nano Electronics; Networks and Security; Signal processing. Each lab consists of one or several research groups. Across the different research groups, the department is also heading several excellence centers. The Department of EIT is the major academic platform for local Swedish industry in the telecommunications area. A lot of the academic research conducted at EIT finds its way to standards and actual products produced by companies like Ericsson. Many graduates from EIT have reached key positions in major Swedish companies. Reading more on EIT's research you may find the answers to questions like "Who invented Bluetooth?" or "How can your mobile phone save you in an avalanche disaster?" The markers shows where EIT PhD's are active today (blue=industry, green=university).